Fortnite is now available to play on Nintendo Switch. The arrival of the free-to-play multiplayer game, which is created by studio Epic Games, was announced during Nintendo's keynote presentation at video game convention E3 in Los Angeles. However, the launch of Fortnite on the latest Nintendo console has been marred by the revelation that Sony will not allow cross-platform support between its PlayStation console and the Switch. The decision has caused outrage amongst Fornite fans. Fornite allows players to sync their progress, skins, and in-game purchases across different platforms using an account with developer Epic Games. This means players can move from a home console, like an Xbox One, to a smartphone during their commute without being reset to the start of the game, or being forced to re-buy their virtual items. However, Sony blocks this functionality for PlayStation 4 players who attempt to sign-in to the game using a Switch. That means those who started playing the hugely-successful shooter on a PS4 – or logged in just once – will now be forced to create an entirely-new account if they want to move to the latest Nintendo console. The block also rules out multiplayer games between PS4 and Switch players. 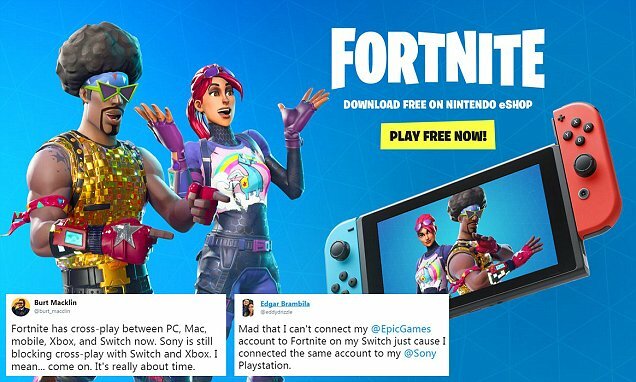 'This Fortnite account is associated with a platform which does not allow it to operate on Switch,' reads the failed login message within Fortnite with a PS4-linked account. Those who have previously held an account on an Xbox One, iOS device, PC or Mac are able to port across their avatar and in-game purchases to a Nintendo Switch without a problem. The decision to block cross-platform support has sparked fury on social media, with industry insiders and fans alike urging Sony to reverse the policy.